Natalie is a little busybody. While we were packing for our trip to Taiwan, Natalie kept herself busy trying on her daddy's shoes and helping us pack (and unpack) the suitcases. Natalie loves to put on shoes. Here she is trying on her daddy's shoes. Natalie has climbed into the suitcase and is looking through all the "stuff". 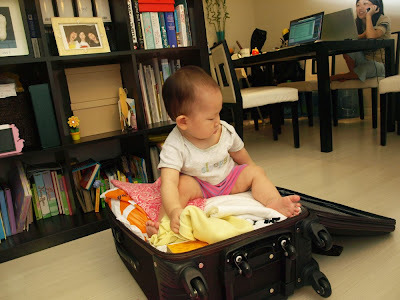 Too bad we couldn't pack her away and save on her infant ticket. She's too big now. Vanessa did the same thinga at the same age!!! At least developmentally, they are doing the same things!